Nobody knows how the tradition started. The origins have been forgotten, confused over time. We cannot even say when it began. When did the first woman of her kind walk the stony path in black stockinged feet, to the top of the mountain and back down to the village? How many have ascended the rocky pinnacle and placed the smooth stone atop the cairn that towers there? And how many have died in the attempt and never returned at all? It is impossible to know these things. We know only that it happens each year, and will continue to do so, as long as we live here among the mountains. 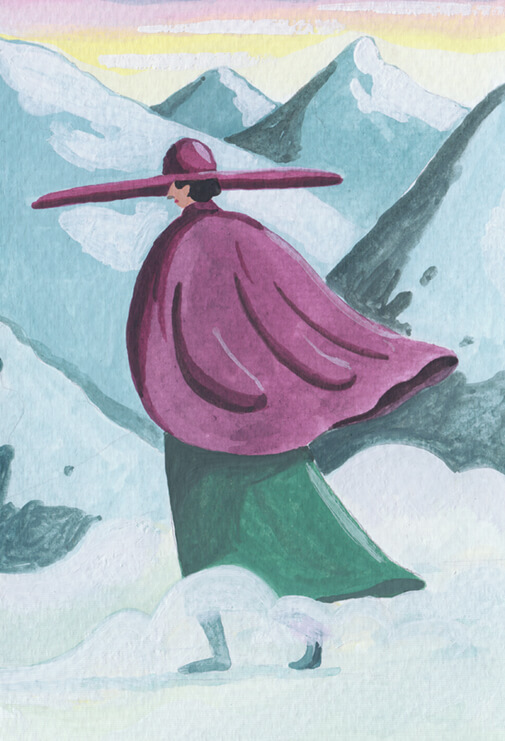 The chosen woman wears a long cloak, a muffler of rabbit fur and a hat – wide-brimmed to shield the eyes from the destination and purple as the delicate mountain flowers that grow only at the summit. It fascinates me utterly. I long to wear it myself one day, but I dare not voice this desire to Papa. Papa remembers them from his childhood, and from the stories of his father before him. He explains that we must support them, because they do what they do for all of us. They undertake their task of endurance to show the mountains that we belong here and we will continue to make our homes here – to raise our cattle, plant our crops, bring up our children. A failure signals bad luck for the year ahead for the whole community, while those who succeed are forever idolised and respected. They choose the women who will come after them. Each year the villagers line the path where the houses end and the mountain begins, ready to offer water or food to the returning heroine, who will always refuse. Accepting any form of help is seen as weakness. I take up my spot on the tree stump in front of our house after lunch. This year the walker is Frau Hensel, my school teacher. From here I can see the path, and I watch the bend where it curves around the mountainside closely for any flicker of movement. Papa thinks it will be a while longer yet and continues chopping wood, the dull whacks reverberating around the valley. The men wait until dusk before they set off in search. I have known this to happen twice before. Once they returned with the walker carried between them, her feet a mess of blood, her cloak hanging limply like a shroud, her face grey as moraine. The second time they returned empty-handed. I imagine that woman, her fall from the mountain like a bird struck down in flight, her cloak streaming behind her like a broken wing. The light has gone by the time the men return. I hear the shouts and cries of the other villagers before I see anything. As Frau Hensel hobbles into view, I understand that they are cries of relief. This year will be a good one, for all of us.